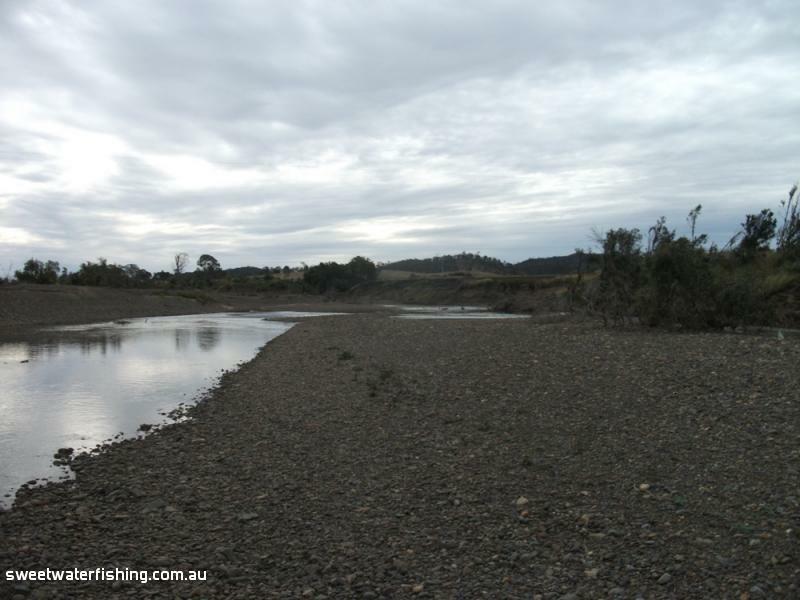 Brisbane River - Toogoolawah. Scrub Ck Rd to Fulham Rd. Fitzy and I did a Brisbane River run from Scrubb Creek Rd to Fulham Rd. I've never paddled upstream of Wivenhoe so all new ground for me. Lots of great snags that had me looking forward to a return fishing trip real soon!! Some shallow rubble areas and some rapids worthy of picking a good line rather than take a risk and hang yourself out to dry in a tree. Thanks Fitzy for the invite. Re: Brisbane Rv.Scrubb Ck Rd to Fulham Rd. Nice paddle Toni, looks like you were in good hands. How was the fishing Toni? 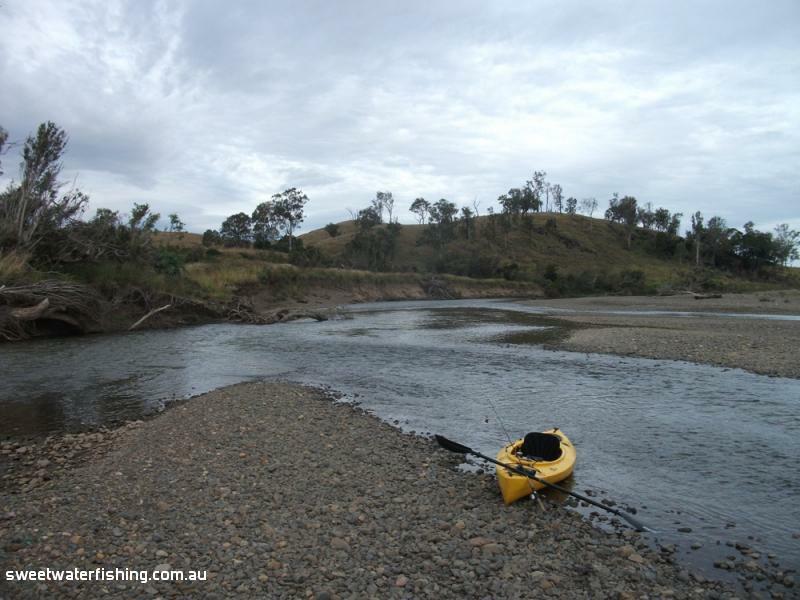 A mate and I were about 20 k upstream from you last week and didn't get a touch. Using some of Fitzy's proven spinner baits too. The water was crystal clear in the feeder where we were. You would have had a reasonable flow I would say, as they had 3 inches in the top of the catchment about 10 days ago. We didn't take a rod. There's some fishy looking water through the whole system upstream of Lake Wivenhoe, there's also some really crappy over exploited water up there as well. Cattle cave in banks, vegetation removed, pest weeds / trees, crops plowed to the rivers egde, its a miracle the river shows any life at all.... The contrasts are constant. That section of river has some rapids with trees in the middle that could easily hang you up or flip you out of a kayak/canoe so proceed with a little caution if venturing up there. I've videos the entire section on previous trips (its rather boring however). Also getting through is the whole of that upper section of river is very flow dependant. No flow = lots of portage. COD (Carry Or Drag) Country. 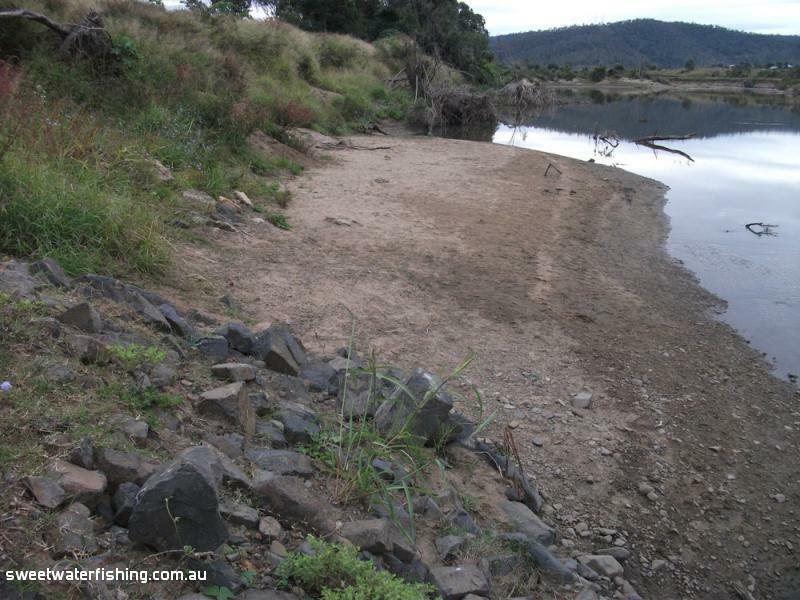 Gordon, ironically there has been no Cod Recovery Program for the Upper Brisbane River, maybe I could/should have done something about it years ago. I've explored a bit as far up as Avoca Vale past Linville. The permanent holes should be ok for holding some cod. I've got to get further up into the state forrest where the river divides into East & West arms. That could be the only place with an original cod left in it. They might also be a waste of time. Wont know until I go look. If you can add any info to the collective it is welcome. In saying the above, its not all doom & gloom. 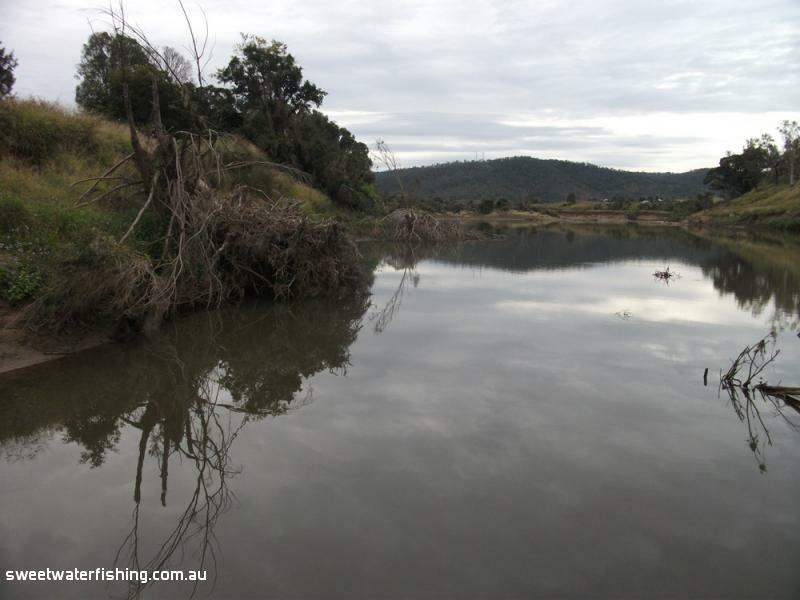 Bass, Golden & Silver Perch are not stocked into the upper Brisbane River but manage to get their way up as far as Linville & beyond from Wivenhoe, some big specimens have been caught right up that way. Hopefully the odd cod has also ventures up there from Wivenhoe as well. 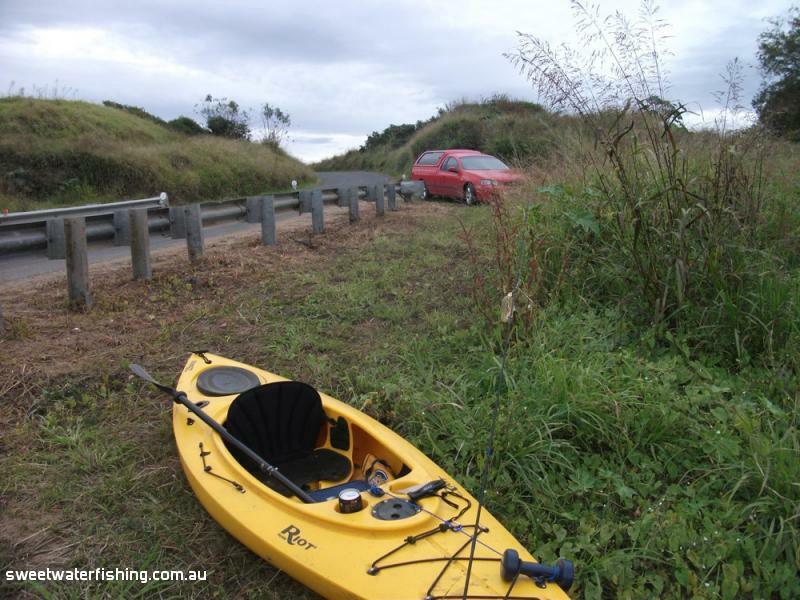 Re: Brisbane River.Scrubb Ck Rd to Fulham Rd. Give you what I can. It was new territory to us. 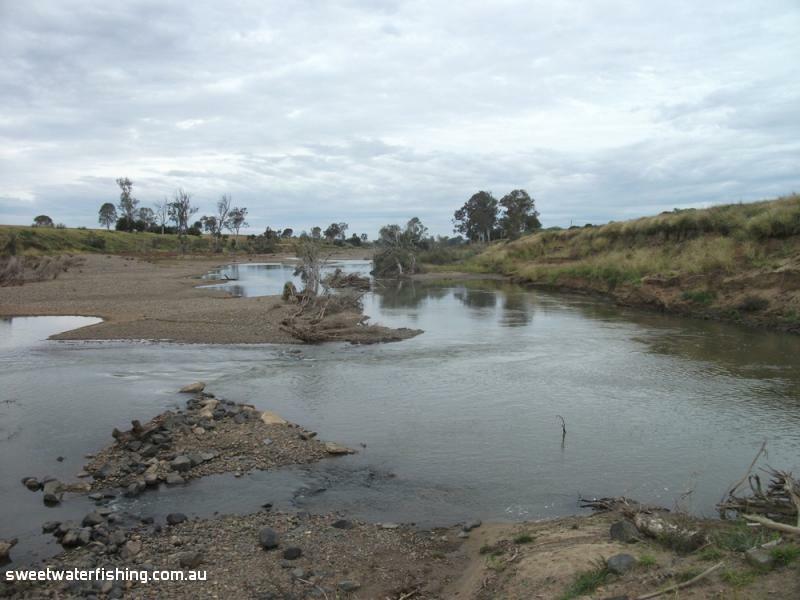 We were in the area where Avoca Creek joins the Brisbane. The river was running yellow from the recent rain as you would have seen. From the earlier flood that ran through there the destruction is something to see. A 6 meter flow took the majority of the bottle brush from the shores. Knocked out gums that have been there for 40 to 60 years and altered the direction of the river in a few spots. On the good side, there are a lot of fresh snaggs that will have to mature. The water will clear as we saw in Avoca Ck, just give it some time. We worked a few k of Avoca, the mate used surface lures and I used spinnerbaits. Beautiful water but not a sign of life except water beatles. Is it possible to be too clean? I didn't expect cod but would have thought a bass would have swum up there. As for the time, we started. The morning mist was still on the water up until around midday. Like to hear your ideas on this. Mostly off private property but that is not a hurdle. 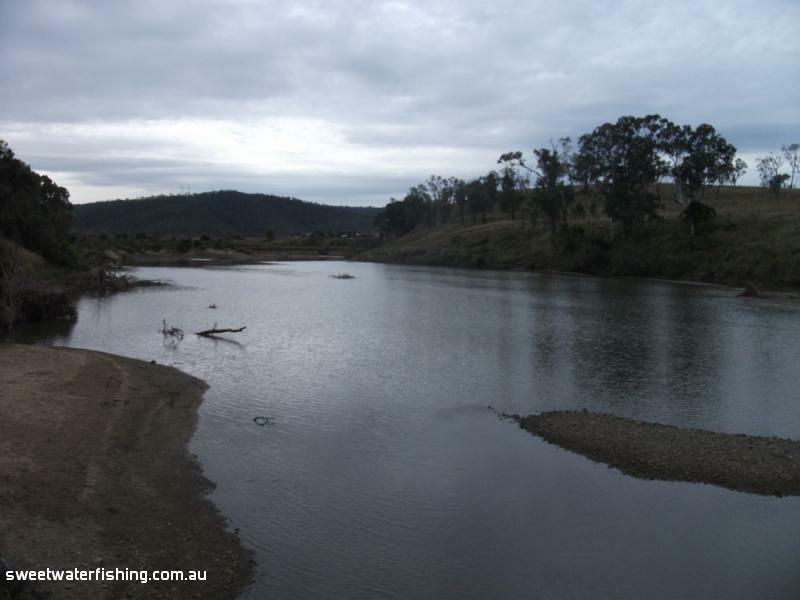 Brisbane River near Toogoolawah. Between Scrub Creek Rd & Fulham Rd (Marks Rocks). 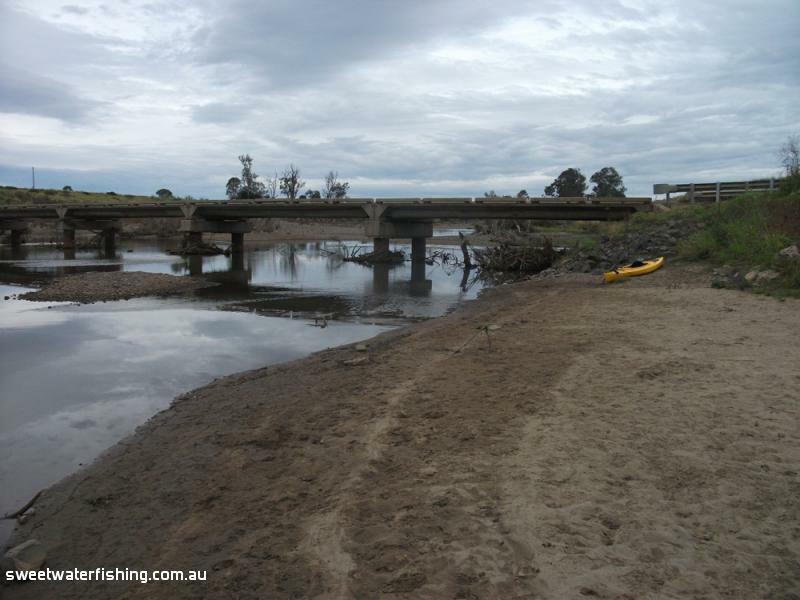 Re: Brisbane River - Toogoolawah. Scrub Ck Rd to Fulham Rd. 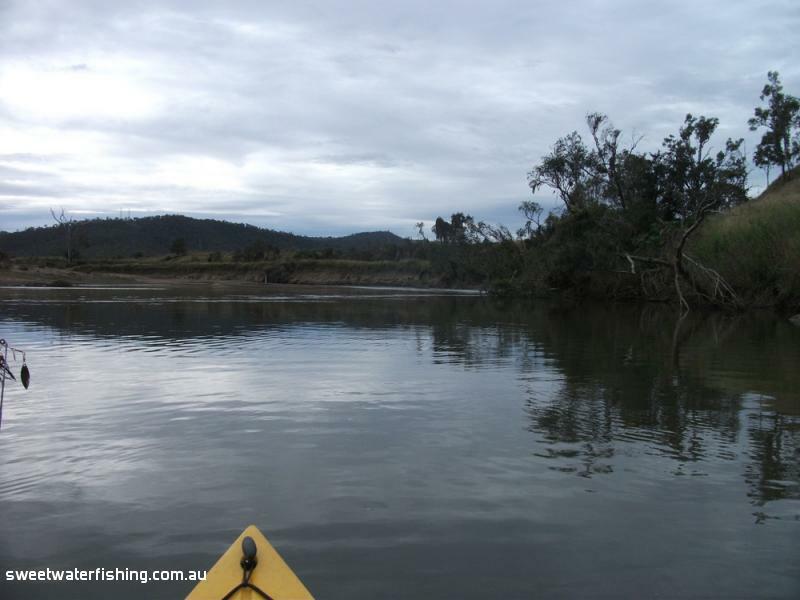 Went for a quick paddle and fish this afternoon on the Upper Brisbane. Launched from the Fulham road bridge and went upstream. Here's an old google map of the area , the riffle zone has definately changed since the big flood . I hooked a metre saratoga here on small pearl soft plastic. Also landed lots of big tilapia that we killed on the spot .and some decent spangled perch upto 30cm released. A nice eeltail about 45cm and Of course the usall catch like barred grunter and big forktail catfish on live baits .